Isn't this setting just fabulous? This beautiful southwestern boho wedding themed shoot was taken at the stunning Winding House in Kent. Check out the use of vintage bottles and minimal flowers on the table for an budget friendly and eco friendly wedding idea. 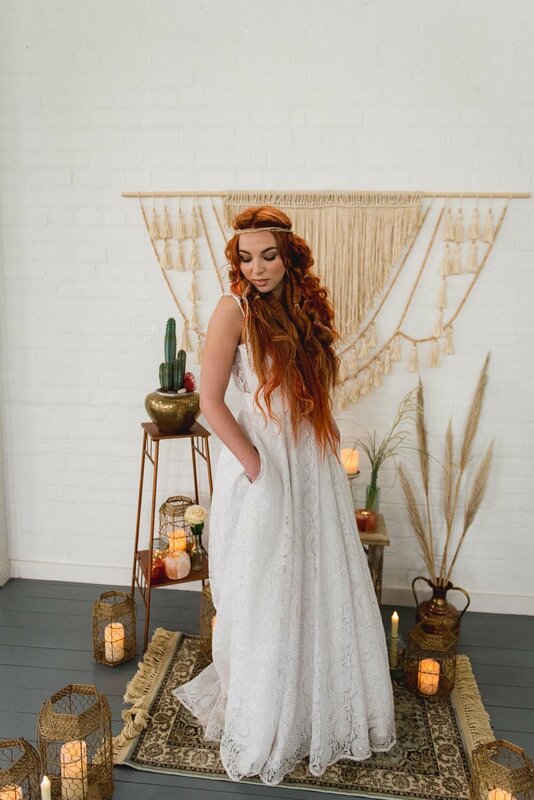 Our eco friendly Celia Grace wedding dresses were used in this shoot, simple and elegant Edie in plain silk and teamed with a bridal lace topper for two bridal looks and Teresa in all lace for impact. Macrame backdrops are so on trend right now, we think this is a trend to follow! Eco friendly in the manufacture and because you usually hire them instead of purchasing so they are used over and over again! Tropical colours in the flowers and cake bring a pop of colour to the white wedding venue. The shoot was featured on the Green Union Wedding Blog. What is not to love about a wedding dress with pockets!? But no putting your mobile phone in there ladies on your wedding day!! Do you have a cute little relative just dying to be a flower girl? We can create beautiful dresses from vintage fabrics, bamboo, organic cotton and silk.